(Nanowerk News) The movement of atoms through a material can cause problems under certain circumstances. 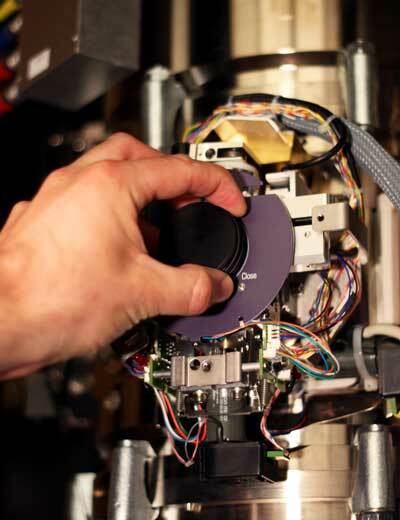 Atomic-resolution electron microscopy has enabled researchers at Linköping University in Sweden to observe for the first time a phenomenon that has eluded materials scientists for many decades. The study is published in Scientific Reports ("Dislocation-pipe diffusion in nitride superlattices observed in direct atomic resolution"). In some contexts, it is extremely important that boundaries are maintained. One example is within thin film technology, which uses extremely thin films of various materials stacked on top of each other. The thermally induced movement of atoms through a material, diffusion, is well-known. A specific sort of diffusion along linear defects in a material was proposed as early as the 1950s, but has remained a theoretical concept since then and researchers have never been able to observe it directly. Instead, theoretical models and indirect methods are commonly applied to measure that phenomenon, known as dislocation-pipe diffusion. The researchers used scanning transmission electron microscopy to study diffusion in thin film. “The material we have studied acts as a perfect model system, but this type of diffusion occurs in nearly all materials. Metals and semiconductors are found in all the electronic components used in in mobile phones, computers, etc. This is why it is important that materials scientists understand this type of diffusion,” says Magnus Garbrecht, associate senior lecturer in the Department of Physics, Chemistry and Biology at Linköping University. “The values we measured agree well with those from previous experiments using indirect methods and with the theoretical models, and this makes us confident that what we are seeing really is dislocation-pipe diffusion,” says Magnus Garbrecht. “The diffusion reduces the strain in the material and this is why it only occurs along the linear defects threading through the material,” says Magnus Garbrecht. Magnus’ collaborator Bivas Saha at the University of California grew the thin films, and the two scientists together have recently been awarded a research grant from the Swedish Foundation for International Cooperation in Research and Higher Education, STINT, to further establish their collaboration. Financial support for the research has been provided by the Swedish Research Council, the Swedish government’s Strategic Research Area initiative into advanced functional materials (AFM), and the Knut and Alice Wallenberg Foundation, among others.